Who is the Alpha Mum? I cannot believe that our very own little Hercules has celebrated his 1st birthday this weekend :-) Everyone has really enjoyed the festivities which have personified James perfectly; a bundle of fun and trouble. As predicted, Bethan thoroughly enjoyed opening James' presents and playing with them whilst the Birthday Boy was more interested in the Sky+ remote (minus battery), eating the wrapping paper and terrorising everyone whilst bursting the Gruffalo balloons that I bought. Yes, the BBQ and ensuing party was a cracking get together and even though it rained, in that Great British tradition, we didn't let it stop us. Children and adults all hunched under a gazebo whilst somebody holds an umbrella over the dad cooking, is the perfect depiction of a BBQ in the UK. I am going to have to agree with that vastly over-generalised stereotype though which is that all of the men gravitated towards the cooking taking place around the BBQ. My question is, why don't they gravitate around your gas hob at 6 o'clock every night when you are cooking the tea and a one year old is pulling so hard on your jeans that they fall down? Yes, a BBQ is a social anthropologists dream. It provides the perfect tableau: men with fire and meat at BBQ; women struggling with children in cave, ahem, under gazebo. Even though I forgot to cut and hand out the birthday cake as well as forgetting to let the young children ice their own fairy buns in addition to having 3 huge vats of jelly in the fridge that I forgot to dish out, the party was still a triumph! Our son had a wonderful birthday weekend because even though we are far away from our families, we were surrounded by good friends. 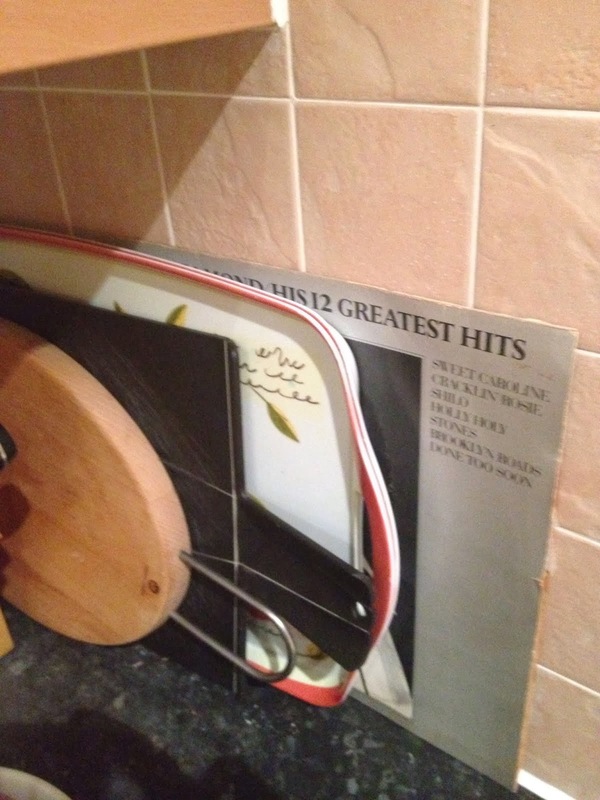 After an awful day, to make matters worse, I find Rob's Neil Diamond LP behind my chopping boards! How to be an Alpha Mum (©) 2014 all rights reserved. Simple theme. Powered by Blogger.